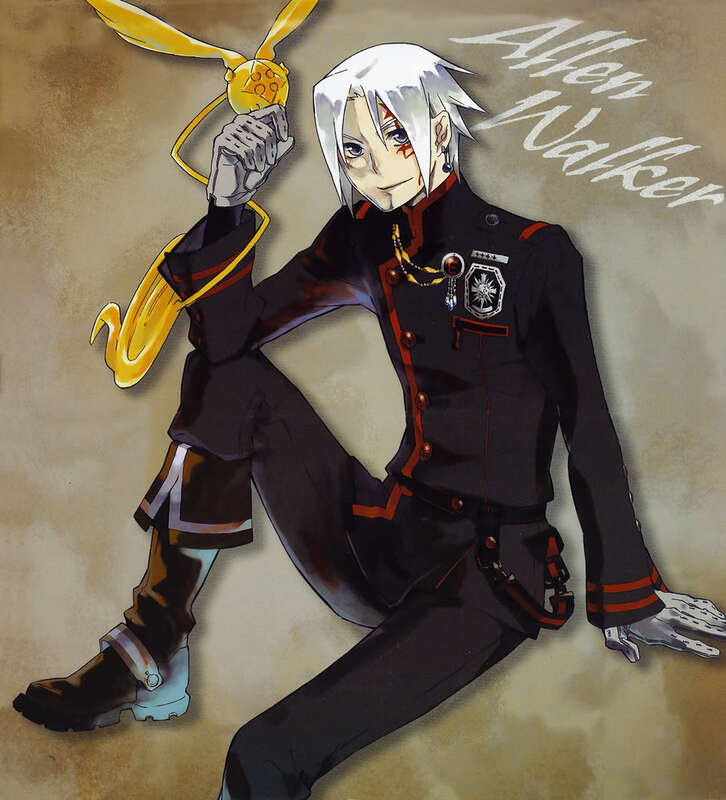 Personality: Allen Walker is a very kind and generous person. He is nice, caring, and well-mannered, always polite. He is quite close to his friends, namely Lenalee Lee and Lavi. Always thinking of the lives of others before himself, he often puts himself in harm's way for other people's sakes. After his family had abandoned him because of his strange left arm, he lived at a circus where he performed odd jobs for money. His personality was different in his childhood. He was rude and cold towards Mana, Cosimo, and the other circus members. He would hit anyone who provoked him, and cursed anyone who bothered him. Allen, Mana's dog, was the only animal that cared for him and the only animal that he cared for. After Allen's death, Mana and Allen (who was called Red in the circus) became friends which formed from the bond of the beloved dog. Because of his experience with Mana as well as being cursed from turning Mana into an Akuma, Allen considers Akuma to be extremely important to him. He wishes to soothe the suffering of the Akuma's human soul by freeing it with his Innocence. He always remembers his promise to Mana, to always continue to walk, to move forward. Allen is seen as a true gentleman throughout his ventures, but he hides the most strife and anger seen through any of the characters in the series. When observing Allen's ventures, he has caused the death and prolonged passing of his adoptive father, Mana Walker, has lost his master, with whom he shared a deep relationship with, was abandoned at birth due to his deformed left arm, and has failed to protect the various characters in the series that he has formed deep bonds with, such as Tapp, whom he felt responsible for his death at the hands of the Level Four Akuma attack. Allen has lost those he has truly formed deep bonds with, has pushed himself into an emotional corner with self-blame, and feels like an outcast from the very humans he protects. Even with all of these negative situations constantly being pushed into his face, he continues to use the Innocence that has so drastically ruined his life to protect the worlds from the Noah and the Akuma. Weapon Abilities:Crown Clown:When invoked, Crowned Clown acts as a body-armored Innocence, forming a white-hooded cowl and sleeve of Innocence energy which covers his shoulders and right arm, while his left arm and hand become slender and black, clad in armor and razor sharp claws. Cross Grave (十字架ノ墓（クロス・グレイヴ）, Kurosu Gureibu): Much more powerful than its previous incarnation, Allen can crucify targets simply by etching a cross upon them with his left hand, effectively annihilating even Level 3 Akuma with a single talon. It can now also be used defensively, generating a shield by drawing a cross on the air. ■Clown Belt (道化ノ帯（クラウン・ベルト）, Kuraun Beruto): The cape of Allen's cowl is released as a webbing of Innocence-energy that can be used to grasp objects, immobilize opponents, or form hardened spikes to impale enemies. It can also be released from the sleeve and glove on Allen's right arm. The ribbons of energy were once used by Crown Clown itself to wrap around Allen's limbs and control him like a puppet when Allen was too injured to move by himself. Crown Edge (爪ノ王輪（クラウン・エッジ）, Kuraun Ejji): A projectile attack which unleashes a barrage of crown-shaped rings from the clawed fingers on Allen's left hand. Edge End (破滅ノ爪（エッジ・エンド）, Ejji Endo): A swipe of raw destructive power dealt with Allen's fully-invoked claw. Sword of Exorcism:Once invoked, the blade can exorcise evil from any vessel it strikes without any harm coming to the vessel itself if Allen chooses. If used against Level 1 to Level 3 Akuma, it vanquishes them in the same effect as the Cross Grave attack, leaving a residual glowing cross crest in the wake of the defeated Akuma. However, in the case of a Level 4 Akuma the sword carries a diminished effect. Allen is shown with the ability to telepathically recall the Sword to himself, should it be separated from his body. Death Ball (いちた たま, Sendo no Mari) When using the Sword of Exorcism, Allen can create an explosion which he names Death Ball. Energy Arc When using the Sword of Exorcism, Allen can release an arc of energy at his target. History: Allen was abandoned by his biological parents because of the supposed "deformity" of his left arm (which was later revealed to be caused by his Innocence). He was eventually found and adopted by a traveling performer named Mana Walker on Christmas Day. Sometime later Mana died, and Allen, tormented with grief and manipulated by the Millennium Earl, turned Mana into an Akuma, hoping that his beloved surrogate father would be fully resurrected. But the Mana Akuma cursed Allen and sliced through his left eye, leaving the "Pentacle" -- the mark of the Akuma -- which scars the left side of his face. This enabled his left eye to see the souls trapped within the Akuma from then on. It was at this same moment that Allen's left arm first invoked as an Anti-Akuma weapon, which instinctively destroyed the Mana Akuma. During the course of this traumatic event, Allen's hair turned from brown into a stark white. Allen eventually meets Cross Marian, a General of the Black Order, who explained to Allen the ways of the Akuma and the trapped souls within them: once a soul is brought back inside an Akuma, they are trapped forever; the only way to save one is to exorcise them from their Akuma vessel. Allen subsequently became Cross' disciple and spent the next three years with him before being sent to the Black Order to become an official Exorcist. During this time, Allen was tormented by his master's constant irresponsible behavior and forced into various odd jobs to pay off the debts that General Cross accumulated. This, coupled with Cross' womanizing ways and harsh treatment towards Allen, led to Walker fearing more than respecting his master whom he never speaks fondly of. When Allen arrived at the order, the Gatekeeper mistook him for an Akuma because of the Pentacle mark on his eye and Kanda is dispatched to kill him. This miscommunication is straightened out after his letter of recommendation from General Cross was finally found on Komui Lee's cluttered desk. Upon his arrival, he met with Hevlaska and was predicted to be the "Destroyer of Time". The meaning of this is never really explained, but Bookman theorizes that "time" referred specifically to the "millennium" or even more specifically, the Millennium Earl. In essence, it is believed that this prophecy means Allen will be the one to someday destroy the Millennium Earl. 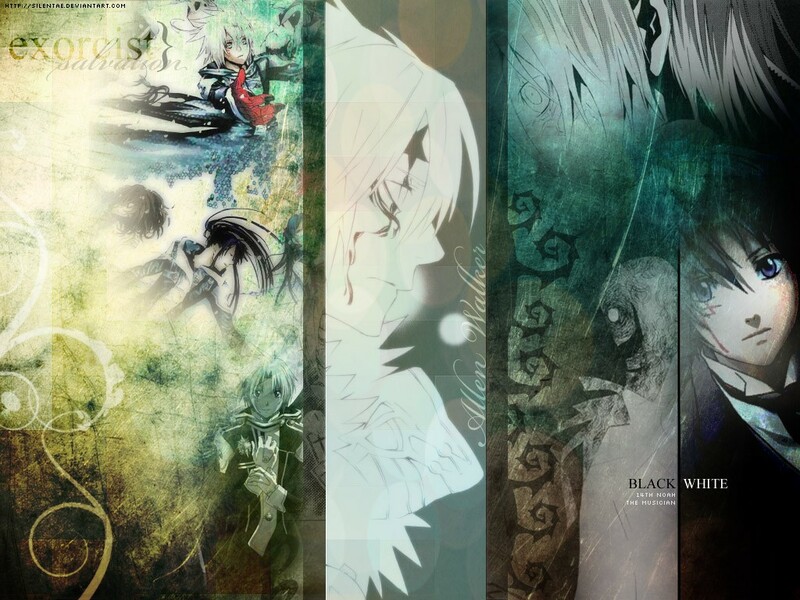 Allen goes on many adventures during his time in the Order and makes many friends, such as Lavi, Kanda, Bookman, and Lenalee. It would later be revealed that Allen was to become the new 14th Noah, and out of fear the Order's higher ups became less trusting of Allen and began to see him as an Enemy. After an incident involving the secretive third exorcists branch Allen's inner Noah had seemingly fully awakened. Allen would be locked up and interogated to find where his allegiance truly lied. He would be released on one fateful day when one of the Noah led a full scale attack on the order's Chinese branch in an attempt to take the 14th and kill him. During the battle Inspector Link would undo the binding on Allen's left arm allowing him to fight. Upon entering the battle the 14th partially took over and fought with the Noah attempting to kill him instead and protect the Innocence. It would be during this fight that the Order's higher-ups would come to see that Allen Walker a.k.a the 14th Noah was on their side. Nagato stood at the highest point in the leaf village so he could maximize his range in controlling all 6 paths of pain. God realm pain and the others ran from tree top to tree top heading towards the west gate area of the leaf. Tendou stopped when he saw a small out post nearby that 3 shinobi were talking to each other. Tendou used his incredible speed and appeared in front of the leaf ninja and quickly movedin forwar and had a chakra disruptor blade pole slide out of his arm and impale the ninja. His head was tilted to the side as he pulled the blade free from the now dead ninja. Pain looked as two shinobi were missing from the group and looked up and saww them as they grabbed god realm. Nagato thought to himself 'futile effort.' God realm then used a minor version of shinra tensei and sent the two guards that had a hold of him flying back words. As the lteaf ninjas landed the remaining paths appeared and nagato had tendou go over to them and impale each nija through the heart with his chakra disruption blade. God real clean the blades and reinserted them back into his body as he turned towards the leaf village. God realm pain then began to speak. "From here on out, we will divide out into a team for diversion, and another for the search. I'll go over it once more, The diversion team will be Asura path, Animal path and Hungry ghost path, and the sdearch team will be God path, Human path and outer path, Konan you go with the search team." Nagato then used his rinnegan and looked at the barrier that surrounded the leaf village. "Konoha has placed a sperical barrier that covers the land and the air around the village," Konan remained silent then spoke " So if anyone without permission enters the village they'll be noticed immediatly." God realm nodded and continued to stare out at the village. "As planned we will send in Animal path up into the sky above, Well give the enemy a wrong idea about our numbers in order to confuse them,Wait for animal paths summoning jutsu." Nagato then controlled Asura path to launch animal path into the sky above the leaf village. Asura path did so and launched the female animal path as animal path broke through the barrier she used a summoning jutsu and summoned all six paths of pain into the village and the group quickly scattered about the village. Asura path quickly ducked into a corner and turned its arm and launched three missiles into the air. The missiles headed into the sky and then changed directions as they crashed into three various different buildings causing some of the buildings to break off. Animal path then used a summoning jutsu and summoned thress giant centipedes and unleashed them upon the village to create more destruction.